Writer Victoria Bolton lives in New York. A graduate of the College of Westchester she has a degree in Computer Science. She works as a computer technician in schools and as a part-time actress in television and movies. Bolton previously released the book Looking for Mr. Potential under the pen name La’Ketta T. Bolton in 2000. A story that begins with someone spitting in another’s face and getting tortured and killed for a secret he can’t reveal immediately raises a lot of interest and curiosity in readers, but the grim fun is yet to begin. Rude Boy USA by Victoria Bolton is a riveting story of an unquenchable thirst for power and terror, featuring characters that will draw powerful emotions from readers. Bernie Banks has slowly but surely established himself as a powerful gangster with unusual but ruthless methods of operating. At a time he and his boys are sure to get on the top of the game, a powerful rival joins the game and a waitress causes a distraction that could break the solid Chimera Group. The big question is: who’ll make it to the top in this game of power where no one accepts defeat? Victoria Bolton’s Rude Boy USA will take readers deep into the psychology of kingpins and the mechanics of the game of power. Bolton writes with unwavering confidence and grace, unveiling a plot that is laced with unusual turns and sudden surprises, a pace that quickens with the reader’s heartbeat. The characters are as real as they are compelling, sometimes funny and at times very, very nasty. The language is blunt, so blunt the reader can squirm at times at what they hear. The dialogue comes off the pages naturally and draws readers in as the plot progresses to a rocket-like climax. This is a book I will gladly recommend to fans of thrillers and crime fiction. An enjoyable read indeed. When you read a lot you come to realize how rare a totally unique voice can be in literature. This realization first came to me a long time ago as I read The World According to Garp by John Irving. I had that same feeling of discovering a truly unique and compelling voice as I read Rude Boy USA by Victoria Bolton. I love these characters. Gangsters are usually portrayed with a certain flair, but I haven’t seen such interesting crime characters or such a descriptive narrative on their lives since The Sopranos. The characters drive Rude Boy USA. This is a story about gangsters in the New York, New Jersey, and Philadelphia area so we know roughly how the story will go. But the journey is so much fun with Victoria Bolton and this amazing cast of characters. The core of Rude Boy USA revolves around the Chimera Group. Bernie, the CEO and one of the four founding members, chose the name to honor his Greek heritage and his obsession with Greek mythology. Ben is the obligatory Italian American of the group. Jerome Dexter, the third group member, is a slim, light skinned black man. John, the last member of the group, is also a light skinned black man. These men are an eclectic group by design and each operates in a different borough of New York. This is the sixties and seventies. When you mix the chaos and excitement of these times with the combustible nature of these characters and the gangster environment you have a great novel. 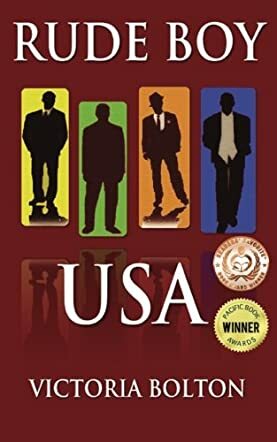 Rude Boy USA by Victoria Bolton introduces everyone to The Chimera Group, the new face of organized crime. Everyone pictures a typical group of Italian or Irish boys when they think of the mob, but Bernie Banks and his compatriots are very different. They are a group of mixed men who fashion themselves in the same image as the Rude Boy culture from Jamaica. Running from a shell investment company, they hope to get the approval of the big mob families, including the Cosa Nostra. Bernie builds an empire and he and his group gain the attention of a rival family called Ambrosino. So who will come out on the top? This is a very different kind of crime story and I have to say I am a fan. This book brings you right in from the get go with charismatic characters and a story line that is interesting from the start. Bernie is a man with big ideas, and even if they aren't the most noble they are something to admire once in a while perhaps. The Ambrosino family is a formidable bunch and honestly I found myself rooting more than once for Bernie, Jerome, and company. Well fleshed out characters and a plot that will keep you interested are just two of the things you will find in this story. So if you want a book that has been well written with a flowing story line and fun, witty commentary, this is the one for you. I enjoyed every minute and I think you will too!